After several discussions with our artist, David Baker, we have created this logo. 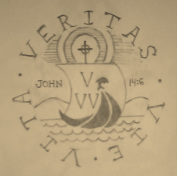 On the outside, the words Vita, Veritas and Via - though not arranged in order, they stand for what V V V stands for. In the middle, it says John 14:6, which is the verse where we derive our group name. The ship represents a similarity to the Coat of Arms of the Diocese of Columbus. The ship is more of a sail boat that is carrying all of us, young adults. Jesus Christ's cross at the top, serving as the light, our guide as we sail through our life's journey. Also, on the sail, are the three letter V's, which signifies the group's name - Triple V.
Thank you David for your vision and your talents in creating our logo! Again, this design was made by the artistic hands of our very own David Baker with ideas that came mostly from JP. 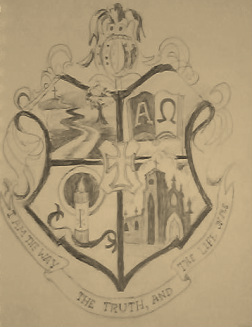 JP had always thought of having a Coat of Arms or heraldic arms to represent the group. After numerous consultations with David Baker over the course of a few months, this is what came out of those discussions. Instead of a helmet, we have an orb like structure to symbolize the earth. The shield is divided into 4 quadrants and at the center of the 4 quadrants is a cross with a smaller shield. St. Joseph Cathedral's facade is shown, being a Cathedral Parish Organization.